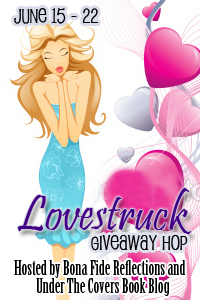 Welcome to the Lovestruck Giveaway Hop! A big thank you goes out to our sponsors Under the Covers Book Blog and Bona Fide Reflections. All commenters on my blog will receive a FREE ebook and a few lucky commenters will also receive a recent release. Do you have a book hero or heroine that completely caught your fancy? I have so many it is hard to narrow it down. How about Rourke from Nora Roberts’ In Death series? I think he is a perennial favorite. What about Rhett Butler from Gone with the Wind? The choices are endless! Share a favorite character of yours and please enjoy the excerpt I’ve included below! Be sure to visit the other participating sites! Michael smiled and took Grace’s hand, urging her from the bed. She followed him in eager anticipation, still tingling inside. His frank appreciation released her sensuality from its cage where it had been long confined. She’d spent day after day trapped in a suit, her hair restrained. Only Michael had seen through her prim facade. Only Michael had explored what was beneath. He led her to the bathroom and turned on the shower taps. Steamy vapor clouded the air, and the tips of Grace’s long brown hair curled wildly. He guided her inside the huge, stone-lined shower. Her bare feet gripped the cool, textured tiles. Deliciously warm water streamed over her skin and Grace laughed—delighted. Get the entire short story for free at the following retailers!